The University Grants Commission has inspected the total infrastructure, facilites and growth potential of the Adesh Institutes through an Expert Committee comprising members from various Councils, Universities and Statutory bodies. The UGC has unanimously recommended for conferment of Deemed University status on account of high quality infrastructure, equipment and faculty created by the ADESH FOUNDATION under Section 3 of UGC Act to the Ministry of HRD, Govt. of India. M.B.A.-Hospital Admin. - Lateral Entry in 2nd yr.
B.Sc. Clinical Microbiology - Lateral in 2nd yr.
B.Sc. Medical Lab. Technology - Lateral in 2nd yr. The institute has lecture halls with ample seating capacity and equipped with multimedia and other audiovisual facilities along with sound amplifying systems with special emphasis laid on participatory teaching. The whole campus is Wi-Fi enabled. The medical college has got a spacious library present on the second & third floors. It has got air cooled well ventilated and illuminated capacious halls for reading purposes with more than 6000 titles of books pertaining to various subjects and 64 national and international journals. 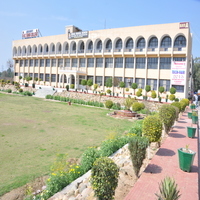 The library is equipped with computers connected to the central internet hub of the college having broad band internet lease line for reference to the latest publications of the research material and other information through medlar and worldwide web. Unlimited access to internet is available for all faculty and students. Photo copier & printer services are available at a nominal cost to the students. The library also has got a huge reading room for the students to bring their own study material to pursue in a peaceful and temperature controlled environment. The campus has got a boys and girls hostel with a capacity of 300 students each. The hostels have got a common room facility with dining rooms having ample capacity and also a common room for TV viewing and indoor games facility. The rooms are well ventilated, air cooled, triple sharing with attached bathrooms. The campus in addition has about 80 staff quarters of various types. The institute also has got playgrounds for hockey, cricket, football, badminton, volleyball, basketball etc. There is a canteen which can house more than 200 people at a time for breakfast, lunch, dinner etc. with a separate seating arrangement for faculty, staff, students, patients & their attendants etc. This institute is having an active placement cell for the bright future of physiotherapists, by appending with INDIAN ASSOCIATION OF PHYSIOTHERAPISTS and Association with Health Professionals International, USA. The institution has attachment with various Multi Specialty Hospitals and Rehabilitation Centers in the following states and territories Ã¢â¬â Delhi, Uttaranchal, Haryana, Jammu, Tamilnadu, Kerala, Karnataka, Maharastra, Orissa, Himachal Pradesh, Uttar Pradesh and Rajasthan. Excellent building and state-of-art infrastructure. Well-equipped laboratories with ultra modern equipments. Deluxe College-bus facilities. Eco-friendly Environment. Well Qualified, Experienced Faculty. Well-furnished separate Boys and Girls Hostel. Training & Placement Cell. Sports and games facilities. Industrial Trips and educational tours arranged. Spacious, well stocked Library. Internet facility and computer training. 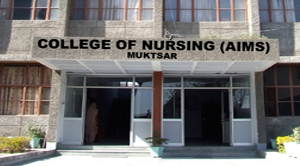 The institution is established on three (3) acres of contiguous land in the campus of the Medical College. The building is developed in a planned manner to run various nursing programmes simultenously as per INC norms. There are 3 lecture halls, 6 different laboratories, Auditorium, Library, Audio Video Room, Offices etc. The hostel is also located in the same campus. Proper security arrangemnts are available in the hostel. Wardens' office, Visitors' Room, Guest Room etc. are available. Hostel : The hostel located in the main hospital campus. This is a beautiful building with attractive furnished visitorÃ¢â¬â¢s room. recreation room and dinning hall. Attractive building and State of the Art Infrastructure. Well-equipped laboratories with ultra modern equipments. Deluxe College Bus facilities. Eco-friendly Environment. Faculty Well Qualified, Experienced and with expertise. Well-furnished separate Boys and Girls Hospital. Training & Placement Cell for arranging Campus interviews and subsequent Placement. Excellent accommodation for Faculty and Staff. Excellent sports and games facilities. Industrial Trips and educational tours arranged. Spacious and well stocked Library. Facility for browsing and computer training. Training & Placement Cell for arranging Campus interviews and subsequent Placement. Library:The college has a well established library which caters to the need of the undergraduate and post graduate students, research scholars and the faculty.Hostel:The hostels and hostel facilities are of high quality and well equipped. The boys hostel can accommodate 150 boys and girls hostel 225 girls respectively Members of the teaching staff are appointed as Resident Tutors in the hostel. The rooms provide most modern facilities and privacy,Cafeteria:The growing bodies need proper sustenance to be healthy and to house healthy minds. We also understand their need for a healthy yet appealing diet.Bus Facility: Bus facility is available from Muktsar, Bathinda, Ferozepur, Fazilka & Jalalabad. Job Mela 2K13 Held in College Campus on 2013 in which Companies like L & T participated. Highly qualified & experienced faculty. Well furnished separate hostels for boys & girls. College bus facility from Ferozepur, Jalalabad, Guguharsahai, Faridkot, Kotkapura, Bathinda. Training & Placement cell for arranging campus interviews and assisting students in getting jobs. Almost all pass out students got placed. Industrial educational trips arranged. Multi Exercise Gym, well maintained and lush green lawns. SIMS software for sending information / progress to parents of students on their mobile. Training & Placement cell for arranging campus interviews and assisting students in getting jobs. Almost all pass out students got placed. 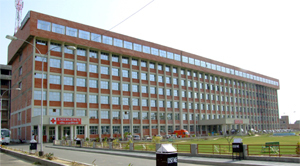 The computer centre is the largest in the state of Punjab and well equipped with 150 computer terminals with latest configurations in an area of 7,000 sq. ft. The central library is developed in a 7,500 sq. ft. area with all kind of books & technical national & international journals. Ultra modern state-of-art lecture theatres with latest teaching aids, laboratories and workshops have been developed as per norms of AICTE. Separate hostel complexes for boys with all modern amenities, faculty residences, principals residences are within the campus. Facilities for indoor games, out door sports complexes and Open Air Theatre are unique. ATM facility has been installed in the campus. Multi Gym, Cricket, Hockey, Football, Volleyball & Basketball grounds are developed in the campus. The auditorium with a capacity of 900 seats and a hi-tech swimming pool are in process of development. A communication and presentation lab. for improvement of personalities of students is functioning to empower them with superior communication skills and to furnish with a plethora of judicious decision-making. What is most important is the faculties drawn from top institutions of country are continuously striving to impart experience-based quality education and a placement cell to support students in getting national and international employments and higher technical education. Institute is running Training & Placement Cell effectively. Many of our students have secured jobs in reputed companies; TCS, Excel Service Noida, Sterling, Telecom Madras Infosys, IBM, DELL, Hewitt Associates and Army & Air force, Wipro, Airtel, HFCL, BSNL, TAta Indicom, etc. Hostel, mess, PCO, canteen, ATM facility available in the campus.Lecture Theaters are equipped with multimedia projectors and computers. Transport:The college maintains a fleet of buses for transportation of the students & members of the staff from distant places such as Bathinda, Faridkot, Kotkapura, Malout, Guruharsai, Gidderbaha, Jaito, Abohar & jalalabad.Library:The library subscribe to regional & national newspapers, national & international periodicals & e-journals. Library sections include Reference Section, Text Book Section, Journal Section, Central Reading Hall etc in shelf system, fully AC and Digital Library.Hostel:Separate hostels for Boys & Girls & Accommodation for faculty exist in the Campus. The College Training & Placement Cell has Ensured 100% Placement of 1st batch itself by grooming students to meet the corporate expectations. It provides Training, guidance & counseling to students by encouraging them to participate in various Conferences, Seminars, workshops & Competitions. The Industry Institute interaction & regular Personality development programmes through industry experts help the students in getting National & International employments. The Adesh Foundation has also set up central Training & Placement Cell in Chandigarh & Bathinda to interact with various companies for arranging tests & interviews for our students. Total Teaching experience of 5 years and having 6 Publications in International journals. He has Guided 4 M. Tech thesis.